Tilted Horizons: Beware the Unseen Left-Turning Truck Crowder! Beware the Unseen Left-Turning Truck Crowder! I had a close call last Sunday morning on my way to Ephrata for the First Sunday Rally, which I thought I'd share. It was about 7:00 a.m. as I was heading north on PA Rte. 10, approaching the intersection with Rte. 41 near Cochranville, PA. (My route is the yellow arrow in the not-so-artfully drafted diagram). This is out in the sticks, but Rte. 41 is heavily-traveled during the week by big trucks. As I rounded a tight right-hand curve and the intersection entered my visual field, the only vehicle in sight was an 18-wheeler southbound on Rte. 10, slowly accelerating away from the intersection. I made the assumption that the light must've turned green just seconds prior. Something "didn't feel right" (cager radar? ), so I slowed from about 45 MPH to maybe 30, moved from the left of the lane to about the center, and entered the intersection cautiously. As I closed on the truck, a small car suddenly darted from behind it, turning left in front of me onto Rte. 41. I climbed on the brakes (admittedly a bit too quickly as I nearly locked the front tire) for a second, then let off as soon as I decided the car was going to continue across my lane and not stop. I then did a quick swerve to the left, behind the car, followed by a quick swerve to the right and another to the left to get back on course. My heartbeat returned to normal in a few seconds and I continued on my merry way to Ephrata. Fortunately for me, there wasn't another vehicle behind the left-turner or it would've made evasive maneuvers a bit more complicated. The elderly lady behind the wheel must've felt very lucky that morning as she had obviously been following so close behind the truck that there was no way she could've seen around the trailer to know what was approaching before she darted out from behind it. Fortunately for her, it was all 165 pounds of me and 500 pounds of motorcycle and not a 10-ton truck doing 50 MPH. Critiquing my reaction, I should've squeezed the front brake progressively instead of employing the "holy sh*t!" grab technique. 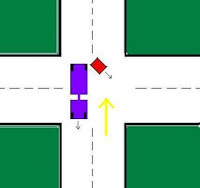 I'm also not sure of my lane positioning as I entered the intersection. Further right would've let me see the car a fraction of a second earlier, but it also would've left less room to make an avoidance left swerve behind the car. What did I do right? I slowed down, covered the brakes, didn't lock up either tire, and didn't panic (much) or fixate on the car. I think my comfort level with steepish lean angles and swerving (All that swerving between the dots and dashes on deserted roads? That wasn't playing; I was practicing!) was an advantage. Please feel free to weigh in with your thoughts or share your own close encounters -- I'm always trying learn from my and others' mistakes and near-misses.